This is the Part One of the Musicarta Canon Project four-module 'Transposing' mini-series. It is intended for players who have completed the study programme because it assumes you know the Canon chords well. The ability to transpose – to change the key of some music in your head and play it higher or lower than the original – is one of the things that defines a really proficient musician. Most professional musicians, both modern and classical, can transpose – some astonishingly well. You can really only say you know a chord sequence, or a tune, or a riff, when you can transpose it. This works the other way round – if you really want to know a tune, or a riff, or a chord sequence, try transposing it. You soon start to see the relative size of the steps between the notes or chord roots, plus many other pattern features, and this will make it a lot easier to remember. Younger pupils’ ability to learn to transpose is generally underestimated. The spin-off in terms of skill and progress of regular practise in transposing is significant, if hard to attribute precisely. 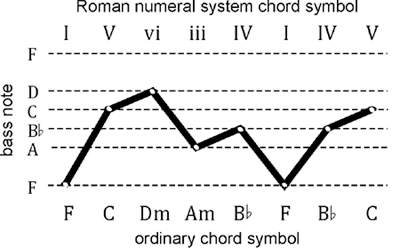 The Roman numeral system (RNS) of naming chords uses Roman numerals to refer to the chords, not just of one key, but of any key. It is therefore extremely helpful in transposing. Take the trouble to understand this way of naming chords, because by doing so can use the chord sequences you learn this way in any key, and the system also helps you learn ‘how harmony works’. The Romans wrote numbers like this. Check that you understand how the system works. You add up ‘ones’ to three, four is ‘one before five’ (represented by V), then you add ones to five until nine, which is ‘one before ten’ (X). Write the numbers out forwards and backwards, then the even numbers and the odd numbers, and so on. 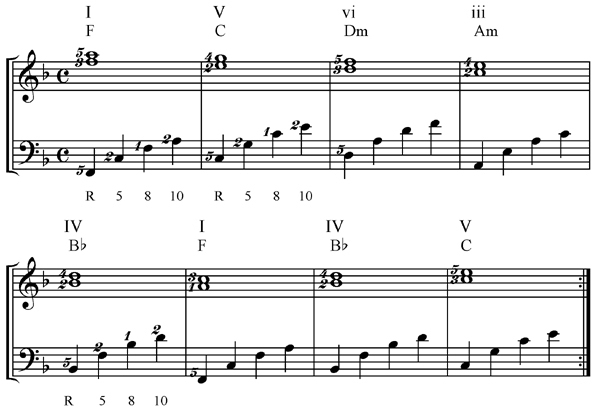 Here is a C major scale – the white keys from C to C. Note names are given below, and the ‘scale degree’ numbers (the steps of the scale) above. 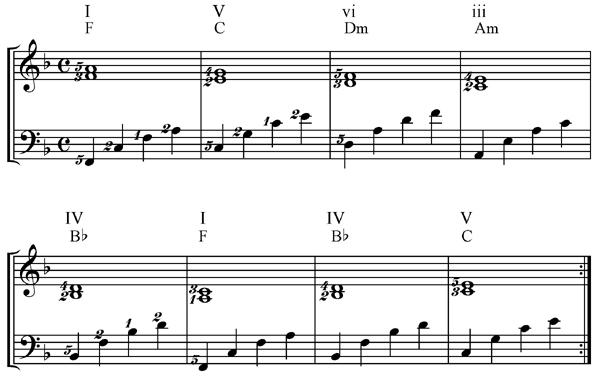 To use the Roman numeral system (RNS) to designate (stand for) the chords, we have to adapt it to show the difference between major and minor chords. The Roman numerals given in the first table in this module are 'CAPITALS', or 'UPPER CASE'. We use these to designate major chords, and 'lower case' Roman numerals to designate minor chords. This combination of major and minor chords is true for every major key. The triad built on the seventh scale degree is always diminished (indicated by the small circle after the lower case viiº). The sharps or flats in a key signature produce the right combination of black and white piano keys to produce this I, ii, iii, IV, V, vi ‘key family’ of chords. …and so on. This understanding of ‘key’ is hard to achieve any other way. You have been playing the Canon in D major, its original key. The key chords of D major follow the same major/minor (I, ii, iii, IV, V, vi) pattern as every major key. Here’s how they look side by side with the chords of C major. Try to copy the audio performance file. Work done playing scales pays off here, helping you remember the F and C sharp s of the D major key signature. We are going to transpose the Canon chord sequence from D major into F major. Revise the key of F (key signature, B flat), both scale and chords. Listen to and copy the audio/MIDI performance files to make sure you can play the key chords in both keys. You play the eight triads in D, then in F, then in D and in F again. Don’t try to play the chords just yet. Play just the roots of the chords (the name-notes in the chords symbols) with the left hand, and you will hear the familiar Canon bass line, only in the key of F.
But if we follow our usual zigzag bass line, we will be starting too high (or going too low), so use low F both times. The bass is shown in this video. The Roman numeral system works well for transposing chords, but transposing the right hand parts requires a different approach. 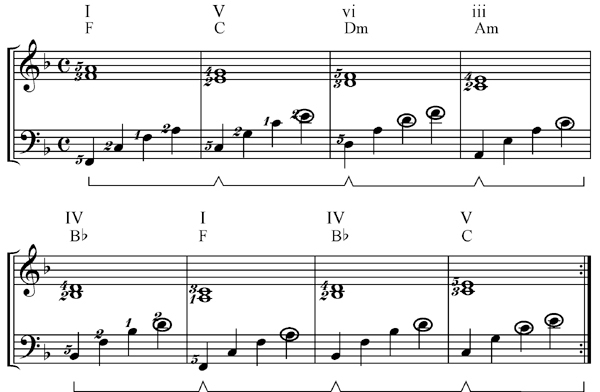 The numbers above the notes are the D major scale degrees, counting up from D (here indicated by R for root), regardless of what the chord is. Make sure you can see how the numbers relate to the D major scale before going on. Now you are counting up from F = R = 1. Your biggest challenge in transposing to F is to remember which black keys to play. You change from F sharp and C sharp in D major to just B flat in F major. Here are the two versions with the black keys ringed. Play through the two strings of thirds one after the other (use the 06-7 video). There are far fewer black keys in the F major version. Now put the thirds in F and the accompaniment together. You might think the treble sounds a bit thin, up so high. Try playing the thirds an octave lower. There are quite a lot of ‘clashes’ here, where the left hand has to play notes the right hand is already playing (circled in the next example). Use the sustain pedal, if your keyboard has one, and release the right hand notes just in time for the left hand to play them. The MIDI file, played on MidiPiano, shows this clearly. It is quite usual to have to ‘get out of your own way’ like this. Play along with the performance file. Because it leaves plenty of room in the treble, the version above is also a good two-handed accompaniment for another instrumentalist to improvise over. Get a guitarist friend to put a capo on the first fret and play along using these chords. The guitarists 'capo' is an instant transposing device - the capo at the first fret raises the guitar chords a semitone, effectively putting the chord sequence into F major. Transposing is the musical skill. It's said that you don't really know a chord sequence until you can transpose it - and conversely, if you do want to know a chord sequence inside out, transpose it! Click through to Module Two of the Canon Transposing mini-series to continue honing your skills.